Lovely card!!! 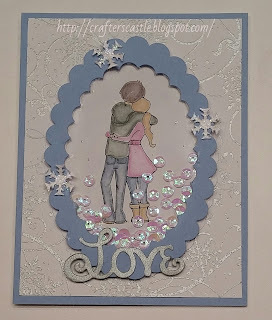 I love the non traditional colors, and the wintery feel....Thanks for sharing with us at CRAFT this week!!! So beautiful, we still have snow here too! Love the soft colors you used for that sweet image Janie! The snowflakes are still timely and are perfect for this mid Feb holiday. I especially like the color of the sequins you used in your shaker card. Thank you so much for sharing your project and creativity at 613 Ave C - and thank you for playing the twist!!! What a wonderful love card you've created! Thanks for sharing with us at Aud Sentiments, hope to see you again for our next challenge! Very lovely card, thanks for joining us. What a wonderful card! I adore shaker cards and yours is just beautiful! Thanks for sharing with us at Great Impressions! Love the couple walking down the path, almost like the snow surrounds them. Beautifully done. Thank you for joining us at OSAAT with your gorgeous card, I do love the image and beautifully coloured too.